Kumasi, a cultural capital of Ghana and long-time seat of the kings of the Ashanti Empire, also gave birth to West Africa’s first electrified dance music: highlife. 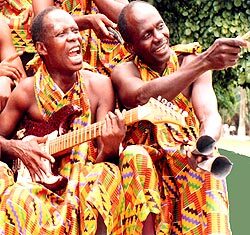 Roadmaster and Agyemang are original players in this tradition, have watched it grow from its inception in their hometown until its intertwining guitars, its driving drums, and its soulful singing harmonies spread across Africa and the world. Though both Roadmaster (pictured right) and Agyemang (left) work in the music business today in Ghana, it was travelling producer Beston Barnett who suggested the idea of making a record which would chronicle the music of their earlier years: the result is The Old Highlife (2001), presenting songs from the simple acoustic guitar format to the full-blown three-guitar/three-vocal arrangements that rocked dance floors in the ’70s. With the success of this album (it is being distributed worldwide by Sterns Music Inc.), Roadmaster and Agyemang have put together an old-style band called The Hi-Life Royals – pictured here in their kente cloth. With some luck, their touring will bring them to the U.S. in the not-too-distant future. “The name Roadmaster was given to me by my mother for my walking ability: I can walk miles on foot. I have lent my voice to many records, including one with Captain Kyeremanteng Atwedie in 1991 and another popular one in 1994 entitled “Shine Your Character” with Daddy Fico. Agyemang and I were working on an album for the most popular football club in Ghana, Kumasi Asante Kotoko, when we met Beston Barnett, an American musician, and recorded The Old Highlife.